Looks like they’re missing two or three steps there to me! That’s to say nothing of the later exercises: once you get to Tiana, who’s near the end of the book, they don’t even pretend to be holding your hand anymore. “How To Draw The Tick” was a joke, but the difference between steps 1 and 2 here is no joke at all. 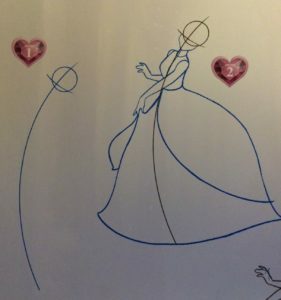 This book either should be a lot longer, or should focus on only two or three princesses; either way I think the steps should be broken down a bit more for the benefit of readers who might not have several years of drawing experience to back them up. However, I’m glad I bought the book, because of the very complexity that makes it so frustrating. 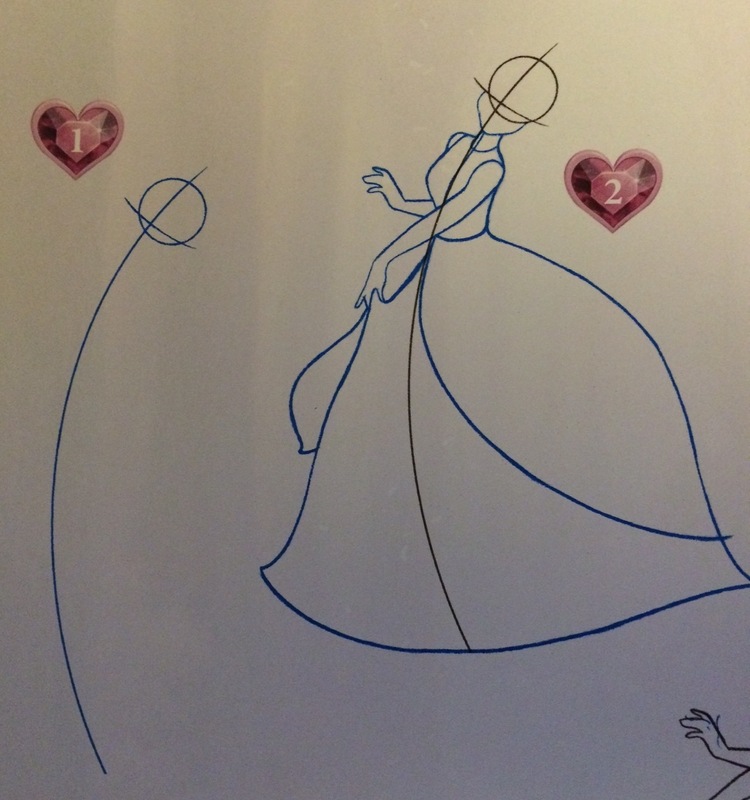 If you have patience and drawing skill, it teaches you how to draw the princesses — not simplified approximations, but the princesses everyone wants to see more of, princesses that will make you the Queen of Buzzfeed for a day if you master them and pick some pop culture reference or art style to mash them up with. All you need is to be stubborn enough to draw the same thing over and over and over. There’s a movie about a tour of the Disney studios, The Reluctant Dragon, in which the man taking the tour meets with animator Ward Kimball, who dashes off a sketch and, when praised, answers that the first 100,000 drawings are the hardest. Even if the book broke down every step properly, it can’t do those 100,000 drawings for you. I’m starting to feel like I really will need to do that many drawings just to produce a Snow White head that looks like Snow White, because the slightest mistake is so noticeable. So I’ve been spending a lot of time with Snow White lately, and I’m not even particularly all that much of a fan of Snow White unless she’s the Snow White in Castle Waiting. As with so many other expressions of femininity, like ballet and applying natural makeup, it takes a lot of hard work to produce a princess face that looks natural, simple and attractive. Trying to draw Snow White reminded me of a blog post by Andreas Deja, who worked as an animator at Disney for 30 years, where he wrote about Cinderella that “if you are off by the width of a pencil line, this character would look like an alien from outer space.” In my quest to draw Snow White, I’ve fallen right into the uncanny valley several times, and you’ll note that I’m not posting any sketches here! (You can see some if you stalk my Twitter account, but I’m not helping you out with a direct link.) 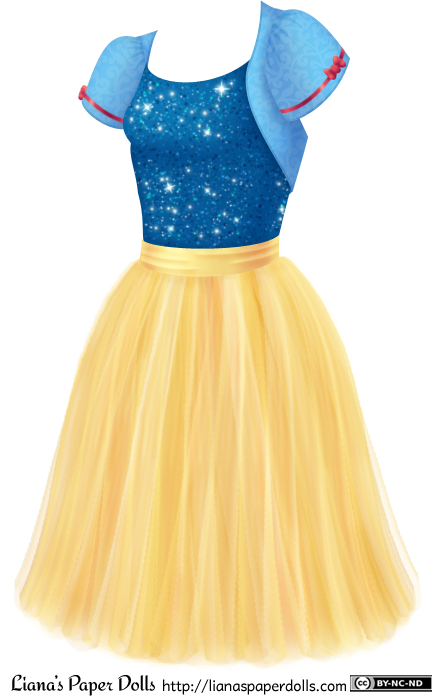 But hey, I’m much better at drawing Snow White now than when I first started. Next week… well, you may actually see that fourth doll, who’s coming along nicely! 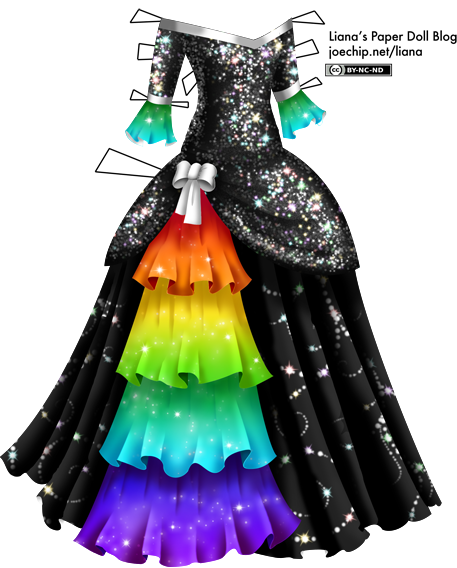 Until then, you can download combined color and black and white PDFs of all of my 2014 dolls and outfits for free! (I’ll add the 2015 ones soon…) Also follow me on Facebook, Twitter or Pinterest for sneak previews, fashion plates and malformed sketches of Snow White’s head. If you enjoy my work, I'd also appreciate your support through Patreon. I’m sorry to have made you wait for this one! I just had some kind of block about it, but now it is done and I can go on to something else. 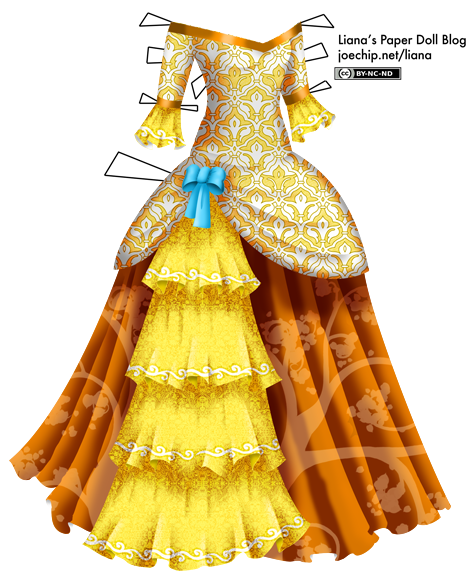 This is my version of a dress worn by Otohime, who is a figure from a famous Japanese folk tale, Urashima Tarō‎ (浦島太郎). In the story, the young fisherman Urashima Tarō saves a turtle from some kids who are tormenting it, and as a reward, he is brought to the undersea palace of the Dragon God and meets his daughter, Otohime (乙姫), who was that turtle that he rescued. He stays there for a few days, but soon wishes to return home. Before he does, Otohime gives him a box, warning him not to open it. When he gets back, he finds that everyone he knew is long dead and his village has greatly changed. He opens the box, but in it was his old age, and he turns to dust and blows away. Some versions have happier endings, like this illustrated retelling. If you’re studying Japanese, give this version a shot. Urashima Tarō‎ is a story that pretty much every Japanese person would know, and Otohime is a famous figure. 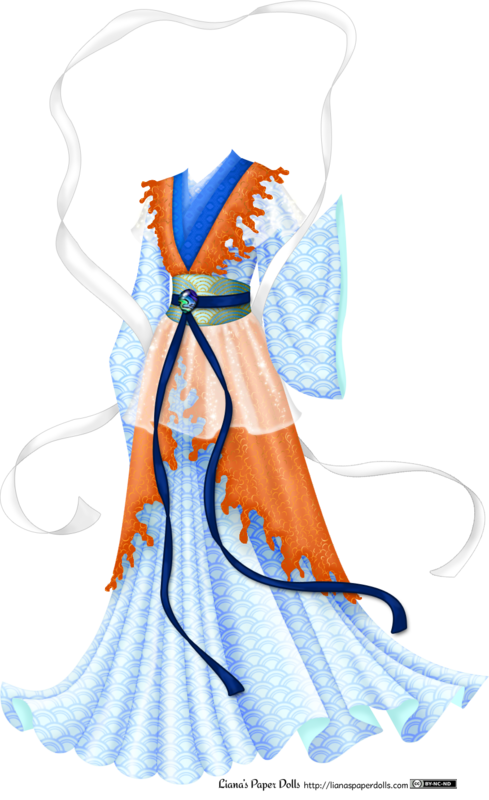 As it’s a very old story, the way she is usually depicted is in a gown like this (with obvious Chinese influence) and not usually a Japanese outfit. As it’s a famous fairytale, though, the depiction varies with the artist. Thank you for all of your fun entries in my contest! I really just need a post to enter someone in the drawing, but it’s more fun for me to read about whose costumes reign supreme. (The cast of Downton Abbey would triumph over the cast of the Titanic, according to my readers.) The winner, although I hate to admit it because he was talking about his plans for what he’d do if he won the other day and I know what I’m in for, is my husband Brian. Come back next week to see what ridiculous design Brian will choose for my 1912 gown, and for a new poll! Follow me on Facebook, Twitter and Pinterest for site updates, complaints about Facebook and gowns with interesting details. If you enjoy my work, I’d also appreciate your support through Patreon. Click for larger version (PNG); click for PDF version. Click here for the list of dolls. Sorry, I said you had seen the last of this one for a while, but Sarah, who won my previous contest by guessing that Milo’s favorite blankie is white, green and blue, didn’t get her request in until after the Sparkly Masquerade Gown week, so here it is now! (No sparkles, though.) She wrote: “Anyways, could you color that dress with a very pale yellow on top with darker orange on the bottom?” So here we have it. I hope you like it, Sarah! The damask is from Pixels & Ice Cream, and the lace, pattern on the skirt and white trim are from Obsidian Dawn. There we have it: ten days of digital coloring! I’ve learned a great deal, and I’m ready to start doing some different things next week. I’m going to shoot for Mondays, Wednesdays and Fridays. Luckily, my husband, parents and even my baby are all quite cooperative. Milo recently started letting me put him down for naps in his crib, instead of requiring hours of rocking while he snoozed. So if you’re happy to see me back, thank that little baby! After ten days of digital coloring, I have basically nothing to say, except for that I’m enjoying myself very much. I have a lot of plans for cool things I want to try, such as making my own patterns (thanks to Julie’s repeating pattern tutorial). For now, which masquerade gown was your favorite? Free downloads of collections of my dolls and outfits to print in black and white or in color! Thank you for reading! Never miss a post by liking Liana's Paper Dolls on Facebook, following @lianapaperdolls on Twitter, or signing up for my mailing list. Please refer to the Copyright & Reuse page if you have any questions. Liana's Paper Dolls by Liana Kerr is licensed under a Creative Commons Attribution-Noncommercial-No Derivative Works 3.0 United States License. Based on a work at lianaspaperdolls.com.